When it comes to fitness goals, there’s no shortage of inspiration in New York City. Just walk down the street here and chances are good that you will run into an inordinate number of good-looking model types. And damn! Don’t you wish you were fit! You swear to do the Full30 and you mean it this time. But then the Friday night rolls around and your BFF just got promoted. Obviously, you have to celebrate with drinks. And cupcakes. And pizza ‘cause it’s late and you might die if you don’t eat. If your constant resolution to get fit never seems to stick, maybe it’s time to break up the monotony of your workout routine. Why be a slave to the basic elliptical and sit-ups circuit? This is New York City after all and you are not boring, so why waste your time on boring cardio when you could do something cool like trapeze?! (Trapeze!) If you’re looking to get creative with your workout, ClassPass has a variety of options that won’t disappoint. 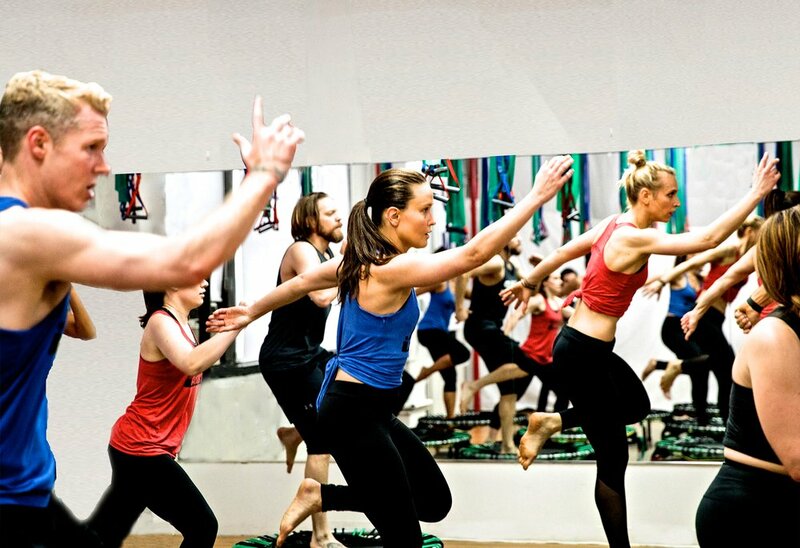 Here are the top non-vanilla studios on ClassPass in New York City. The trapeze classes at STREB are my favorite ClassPass option thus far because I can basically live out my childhood dreams of joining the circus. And, I’m definitely not alone in this fantasy because STREB offers a whole variety of adult trapeze courses for many different skill and fitness levels. The staff is warm, welcoming and will make adjustments based on your ability. Classes are small so you get plenty of flying time. It’s fun and a surprisingly thorough workout. If you really enjoy it, consider signing up for one of their 4-week workshops. Surfing in the winter? Yes, please. And the best part? You don’t even have to get into dirty, garbage-ridden NYC water. SURFSET uses unstable surfboards to simulate the challenges of real surfing and make your muscles to work harder. The workout involves an interval combination of yoga, cardio, and core exercises all while you try to balance on this board. You can see why this is an intense workout. While it’s no Hawaii, we’ll take what we can get. Try to grab a spot near the projectors so you can pretend you’re in a tropical paradise. I take spin classes occasionally, but my derriere is not a fan of itty bitty spin bike seats. I swear Queen’s Fat Bottom Girls plays every time I get ready to lower myself down on one. Sorry, but it is the truth! Enter AQUA Studio. It’s spin class in a pool. The Tribeca studio is gorgeous and the changing rooms are almost spa status. No jostling for a tiny shower here – there are five clean, comfortable showers. Plus since this class is in the water, you’ll feel less sore (if at all) the next day. Can’t make it out to STREB in Brooklyn? Check out Aerial Arts. Located in Midtown East, this studio has both floor and aerial exercises. They offer trapeze, silks, ropes, contortion, acrobatics and flexibility courses. If you’ve ever wanted to live your dream of being a backup dancer, Broadway Bodies is for you. Come on, all you aspiring shoop ba-doop girls, I know you’re out there! At Broadway Bodies, you can learn choreography from your favorite artists like Britney, Rihanna, and Beyoncé in an encouraging environment. No prior dance experience is necessary. Recovering from an injury or just looking for a low to non-impact workout? Deep water running at RJ Valentin’s is a great way to ease back into it. Instead of putting all your weight directly on your joints as you do when you run in the park, water running stimulates the same muscles but instead, you are moving through a pool wearing a floatation belt which reduces the impact. It’s great for beginners, runners looking to cross train, or marathon training. Bring your bathing suit and a towel. They’ve got the showers and locker room accommodations taken care of. Brooklyn Boulders newest Long Island City facility offers not only 25,000-square feet of climbing surface, but also yoga and capoeira classes. It is suggested that newbies enroll in the “Learn the Ropes” class that covers the basics of top rope climbing. Who doesn’t love hammocks and a good stretch? Really. If you do too, try out ANYA. 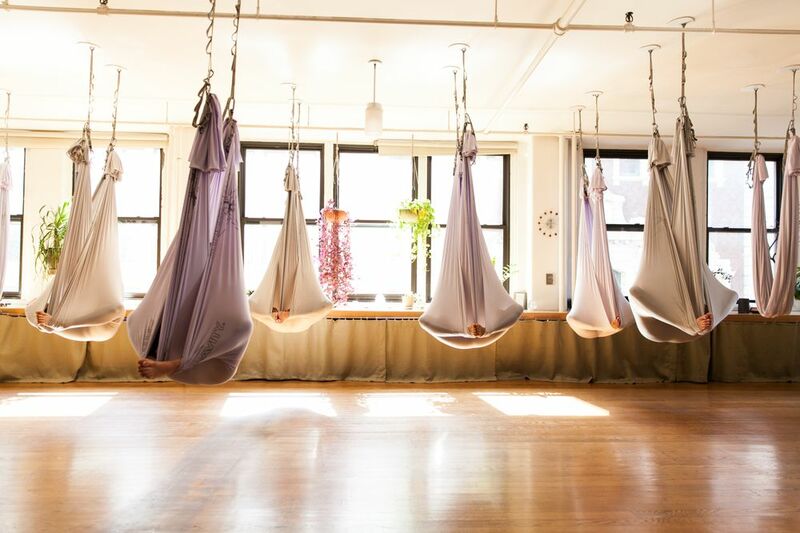 This studio offers pilates and vinyasa-hatha yoga sessions, but my favorite are their AntiGravity® aerial yoga classes. Wrapped in their hammocks, you’ll feel like you’ve retreated into your very own protective cocoon, away from all of the hustle and bustle of the city. While spin and running are great cardio workouts, bouncing on a mini trampoline is just more fun. trampoLEAN in the Flatiron district has mastered the art of combining fun with an effective cardio workout. Their selection of workouts uses resistance bands, hand weights, lunges and squats to sculpt a leaner you. All of the studios listed offer introductory courses for free or at a discounted rate so don’t fret if you do not currently have a ClassPass membership. If you’re curious about giving them a try, get your first three classes for $5 by clicking here. ClassPass is a membership service that allows users to take classes at various boutique fitness studios for one monthly rate. This monthly fee is considerably less than one would typically pay for individual classes at each studio à la carte. Studios benefit from being able to fill vacant spots that would have otherwise gone unsold, especially outside of peak times. ClassPass isn’t the only fitness subscription game in town. Check out other options below. FitReserve: Similar to ClassPass, FitReserve charges a monthly rate for access to a multitude of studios in the city. No blackout time slots and less frequency restrictions is where this service really shines. MINDBODY: Originally starting out as a popular scheduling management software for fitness organizations, MINDBODY has also gotten in on the boutique studio drop in game. Rather than pay a monthly fee, their app allows users to pay à la carte for discounted fitness classes. Users can also book other beauty and wellness services like salon appointments, manicures, and massages. Nice particleboard desk. Put a plant on that thing already.